"Like" token, awarded by MGChecker. 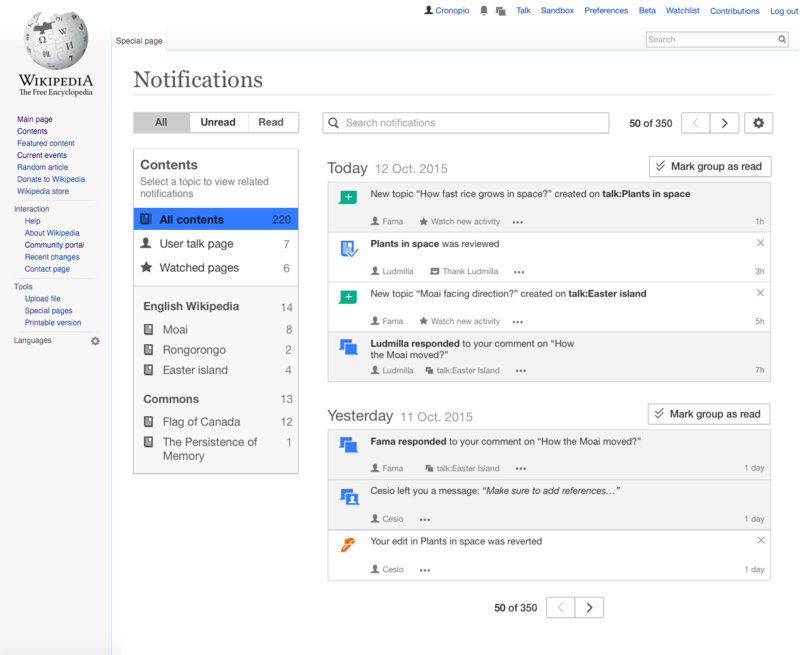 The Notifications page provides access to the full list of your notifications. Currently, all notifications for the local wiki are shown grouped by day, which simplifies going to a specific time period. However, it does not provide much flexibility when looking for the relevant notifications for different activities. Cronopio wants to check the recent notifications about discussions on his user talk page from all different projects. Cronopio is able to triage what to reply to and can keep some for later if he had no time to reply (e.g., by marking some notification as unread again ). Fama wants to find all the mention notifications she got on a very active topic from a user she is trying to help. She recalls a specific question she wants to look for first. 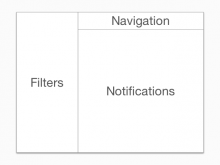 The end goal is to make it easy for users to find relevant notifications. We want the Notification page to become a regularly used entry point for frequent contributors to organise the activities that require their participation. Some design ideas have been put together in a prototype and documented. More research is needed to identify the needs users have when using notifications to complete different daily on-wiki activities (T124416). Flexibility. Notifications are the entry point to many different on-wiki activities, allowing users to get the information they need for their task is key. Efficiency. Users are interested on the information behind notifications, the quickly they can pass through notifications the better. Reducing navigation steps (e.g., surfacing relevant information and actions) as well as making elements easy to process will be helpful. 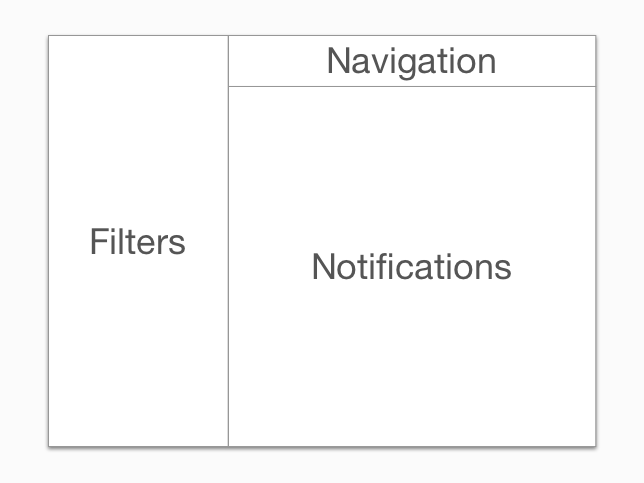 An inbox-model based on three areas: filters (to quickly select what you are interested in), navigation (to move around) and the content (notifications). The main filters allow users to focus on pending/completed work depending on their activity. 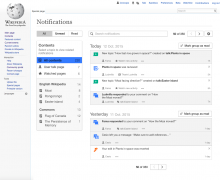 Users can check at a glance the content with new notification activity, and focus on those topics. Quick access is provided to check usual locations. The navigation bar allows users to search for specific notifications as well as to change how the list is displayed. Crosswatch is a related project which supports displaying and filtering all your notifications, and we can learn about some of their usecases (more details in crosswatch). Invalid None T137742 Change the icon for the cross-wiki notification bundle "dismiss" action, to distinguish it from "mark as read"
Pginer-WMF added projects: Epic, Notifications, Collaboration-Team-Triage. Pginer-WMF mentioned this in T114351: Better organisation for the Notification System. Pginer-WMF added subscribers: Catrope, Aklapper, Pginer-WMF. Is it possible you have done some little mistakes at the pictures? Why you can see entries from "2 days ago" in the "Today" section? Why you can see Notifications which are about actions not done by Fama a filter is active that should hide them? It would be nice if you can clarify this points. Definitely. Thanks for catching them. At this point the main intention was to represent the overall idea for the design direction. An early version was included in this prototype to get some initial feedback. We'll be iterating those designs in order to polish the interaction patterns, add more details, and also reducing inconsistencies to avoid misunderstandings. On 2/3/16, product managers and others from the Editing Team considered the prototype of the Notifications Page below during the regular Product Pitch Meeting. Below are notes from that meeting. It’s not very complicated, but it must be remembered that the content will come from different languages with different directions, different fonts, font-sizes and line-heights, etc. It may be a challenge to handle [[Village pump]], [[Wikipedia:Village pump]] and [[WIkipedia talk:Village pump]]. It’s an issue in the rest of Notifications, too: T56433. James: The fact that you’ve got things there is implicit, right? Maybe use the Person icon against “user talk page” on all instances to make it stand out? The use of "X" for marking as read has been discussed in the past and we decided to keep it as it was initially and explore alternatives. I did an initial explorations of approaches at T126214. Pginer-WMF created subtask T129460: Allow to mark as read items and groups in the Notification Page. • Mattflaschen-WMF reopened subtask T129169: Change current no-JS Special:Notifications to use core Pager as Open.